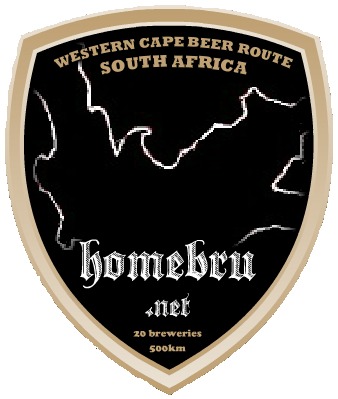 E very now and then I will update the Western Cape Brew Route or Western Cape Beer Route. It is a long tour but you could just choose the ones you like and make your own tour. New breweries: Cape Brewing Company, Stellenbosch Brewing Company, Stellenbrau, Karusa, Herold Brewery and Dieks Bru. Note: Some, if not all of these breweries are difficult to find. There are very few signs pointing to the breweries so please check there location thoroughly! Check the map below and please contact the breweries before going there. There are some breweries that does not have an established place yet and some of them has not even started yet like Gallows Hill Brewing Company, Royal Mzansi, The Real Beer Company (Retreat), Rock-Kestrel Breweries (Stellenbosch) and Brothers In Arms Brewery. Please let me know if there are any breweries missing! The idea of a brew tour is to visit breweries and get information directly from the brewers. Mainly for people interesting in brewing. A shorter beer tour is for people that would like to visit one or two breweries and then visit a restaurant or two for a taste. In the January edition of the Brew Route Paulaner Bräuhaus at the V&A Waterfront was a really good start. Sadly enough they have closed there operation and a new location is not yet revealed. Instead you could start at Boston Breweries in Paarden Eiland. They do not have a brewery tour at the moment but do not hesitate to ask them anyway. Jack Black is a contract brewery and is currently brewed at Bostons. Bierwerk is also a contract brewery but they currently brew at Camelthorn in Windhoek, Namibia. There is a new brewery (Woodstock Brewery) coming up on 252 Albert Road/1 Gelb Lane in Woodstock (close to the Old Biscuit Mill). Beer Tour: Visit Den Anker and Mitchells at the V&A Waterfront or &Union on Bree street. Roeland Liqours at Roeland Street is a good store if you are looking for craft beer. If it is Saturday you could go to City Bowl Market on Hope (Hope Street) or the Neighbourgood Market at the Old Biscuit Mill. Then I would suggest you take Main Road down to SAB Millers Newlands Brewery. You can do a brewery tour in the new brewery but the old Heritage Park is well worth a visit in itself. The old Malthouse and the Brewery tower is a must if you are interesting in brewing and not just drinking beer. Beer Tour: One of the best craft beer pubs in Cape Town (Banana Jam Café) is very close to the brewery in Newlands. After visiting Newlands you could go down to Kommetjie and visit Valley Brewery or …. … take the N2 down to Somerset West and visit Triggerfish Brewing and the new brewery Devil´s Peak Brewing Company. Triggerfish is one of the best micro breweries in South Africa at the moment and offers free tasting. Triggerfish is a must if you are doing a brew tour . Devil´s Peak started up early this year. They are also looking for new premises so I have to update this Brew Route when they relocate. After Somerset West you could continue the N2 east and turn the R43/44 down to Honingklip Farm. There you will soon find the new brewery Honingklip Brewing. They are building the brewery at the moment but it is soon to be finalized. Honingklip brewery will be a must if you are doing a brew tour. Keep on the R43 to Birkenhead Estate in Stanford. You walk right into the brewery when entering the main building. They have some really nice equipment to check out. From Stanford you take the R320 and turn south on the R316 down to Napier and Napier brewery. Later this year you could hopefully head down to Struisbaai and visit Bulldog Brewery . I will keep you updated when they have all there licenses and is ready to start deliver. After that you could go up again to Bredasdorp and take the R319 back to the N2. Now you have to make a choice. If you are up for a long drive drive east to Knysna to visit Mitchells Brewery. If possible, try to visit George hops farm and Eden Microbrewery (at Misty Meadows Farm) on the way. Just north of George you will soon have a new brewery (Herold Brewery) in the small village of Herold. If you continue to drive north from George along the N12 (R62) and later on the R328 you will find the small brewpub Karusa on the Karusa Vineyard. If you stayed on the N12 (instead of taking the R328) you would come to the small village of De Rust. Here you could soon find the small microbrewery Dieks Bru. The other option (if you do not want to drive that far away from CT) is to turn north on R60 and later the R62 up to Montagu. There you will find The Mystic Tin Karoo brewery. Take the R62 back and then the R60 north to Langeberg near Robertson and visit Saggy Stone Brewery. Drive up to Worchester, take the N1 towards Cape Town and then the R310 and R45 down to Frenschoek. Visit Dieu Donné Brewery on the Wine estate/Restaurant with the same name. From Frenschhoek: Take the R45 north and turn left (West) into Helshoogte road down to Stellenbosch. Then drive towards Cape Town along the R310 and stop at the Barrique Brewery (The Village Brewery) and at Stellenbrau . If it is Saturday please take some time to visit the Stellenbosch slowmarket at Oude Libertas. … Darling and there really nice taproom at Darling Brew. They still brew at Bostons Breweries so there are not any brewery to visit yet.